The adventures of Bibi Fricotin, a clever young lad and his companion, an African youth named Razibus Zouzou. With the help of kindly scientist Professor Radar, and the occasional hindrance of Clouseau-like Inspector Martin, they travel to Mars, through time and discover lost civilizations. Their arch-enemy is the self-important, misguided Professor Trublion. Bibi Fricotin was created in 1924 for the magazine “Le Petit Illustre” by Louis Forton, the author of the equally famous Pieds Nickeles and the grand-father of modern comic artist Gerald Forton (Bob Morane, Arak). Bibi was first introduced as a lad working for a race course. Soon, following the tradition of Tintin, Spirou, Zig & Puce and others, he embarked on a series of world-spanning adventures. In 1936, after Louis Forton’s death, the character was taken over by Gallaud. In 1947, it was entrusted to artist Pierre Lacroix. 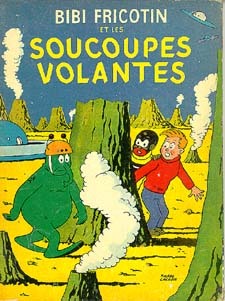 After WWII, the series was published in “L’Epatant”, then starting in 1955, in “Jeunesse Joyeuse” which was renamed “Le Journal de Bibi Fricotin” in 1964. Bibi Fricotin’s adventures are still being reprinted today in a line of graphic novels for children. Numerous writers worked with Lacroix, including "R. Lortac" who penned the science fiction stories featured on this page. Bibi Fricotin, Razibus, Prof. Radar (right) and arch-enemy Prof. Trublion (left) fight robots in the year 3000 (1963) The Authors Pierre Lacroix (1912- ) learned his skills with Louis Forton, the creator of Bibi Fricotin and the Pieds Nickeles. After a stint in advertising, he returned to comics in 1947 to take over Bibi Fricotin. FOR MORE ABOUT R. LORTAC, .